Your estate plan should be the most important set of legal documents you ever create and execute. With this in mind, choosing an estate planning and elder law attorney to help you with your estate plan may seem like a daunting task, particularly if you have never needed an attorney before. At The Law Offices of Kobrick & Moccia we understand how important your estate plan is to you as well as how intimidating it can be to try and choose the right attorney. After all, creating an individualized estate plan requires divulging a good deal of personal and financial information, something that is understandably difficult to do with a stranger. At the Garden City, New York Law Offices of Kobrick & Moccia, however, our clients are not strangers. As members of the same Nassau County community, the attorneys and staff of the Law Offices of Kobrick & Moccia, strive to create a lifelong relationship with our clients so that we can be there as their estate planning needs change and evolve. Nassau County, New York is a suburban county located on Long Island, just east of New York City. In 2012, Forbes magazine reported that Nassau County is one of the highest income counties in the United States and the most affluent in the State of New York. As any Nassau resident can probably attest, Nassau County is also the most expensive county in America to live in. Our Nassau County, New York office is very centrally located in Garden City, New York, at 1305 Franklin Avenue. The Village of Garden City is an excellent place to live and work, just 20 miles from the heart of New York City. The almost 22,000 residents of Garden City enjoy the benefits of small town living without losing the conveniences and options available in a large city. 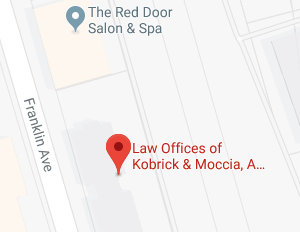 At The Law Offices of Kobrick & Moccia we made the decision to focus our practice on issues relating to wills, trusts, estates and Medicaid qualification because we feel those are the issues that matter most to our friends and neighbors in the community. Nothing should be more important than protecting those you love, both now and in the future. Estate planning does just that which is why we dedicated our legal practice to estate planning and elder law matters. Experienced attorneys Saul Kobrick and Anthony Moccia, travel to different locations in Nassau County, New York, from Rockville Centre to Plainview, from Glen Cove to Massapequa, and other neighboring communities, and offer free presentations on Wills, Living Trusts, Medicaid and Nursing Home Protection, to educate the community and help Nassau residents preserve and protect their wealth. We also realize that many of the issues involved in estate planning are highly personal in nature and not easily discussed with a stranger. Fortunately, we are not strangers in the community. The attorneys and staff at The Law Offices of Kobrick & Moccia are very much part of the Nassau County community. As such, we don’t just help you create an estate plan and forget about you. We create an ongoing relationship that allows us to be there with you during the various stages of your life. As your life evolves and changes, so should your estate plan. For example, when you first get married, incapacity planning takes on a heightened importance. If you have a child with special needs it will be imperative to incorporate special needs planning into you plan. If you added a family pet to the household you will want to consider pet planning for your estate plan. And if you are a senior citizen living in Nassau County, aware of the astronomical costs of assisted living facilities and nursing homes in the most expensive county in America, you will want to plan ahead and develop an estate plan that will shelter your hard earned assets from these costs. Wherever your life takes you, we want to be there with you to help ensure that you, your assets, and your loved ones are protected. If you would like to discuss your estate plan, contact the Garden City, New York estate planning attorneys at The Law Offices of Kobrick & Moccia by calling 516-248-9500 to schedule your appointment or to register for one of our estate planning or Medicaid seminars.